Laura Vanderkam is the bestselling author of What the Most Successful People Do Before Breakfast, I Know How She Does It, and 168 Hours, among others. Her 2016 TED talk, "How to Gain Control of Your Free Time," has been viewed more than 5 million times. Her work has appeared in The Wall Street Journal, The New York Times, Fortune, and other publications. She lives with her husband and their four children outside Philadelphia. "Laura Vanderkam is one of the world's leading experts in time management and productivity. If you're feeling too busy, stressed out, or overworked, reading her insights in Off the Clock can change your life." "For every minute you spend inside this book, you’ll get back ten. 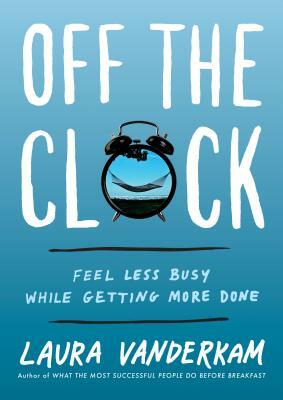 Off the Clock will show you how to spend your hours more meaningfully, reclaim vast amounts of wasted time, and live a better life. Picking up this book will be one of the most valuable investments you make in yourself." “Short of discovering an additional 25th hour what makes time so different for those rare productive, unstressed people? Laura Vanderkam knows--and can teach you. If you want to do more without losing your sense of peace along the way, make time for Off the Clock." "I recognized myself in almost every word of Laura's excellent book. And tracking my hours was an eye-opener for me, as it appears I'm one of the people who's been unrealistic about how I spend my days. This book is liberating, useful, and so important in this era in which everyone seems to feel overwhelmed."